You’re probably wondering why I decided to post my Korean Artist Of The Week days late, and at a strange time. The short answer to that is: ONEHALLYU WAS DOWN AND 24K CAME BACK WITH THE JAMMIEST JAM! If you aren’t already familiar with the boys from Choeun Entertainment, then consider this a crash course. Please read carefully, do not punch your device from excitement, and prepare to have your body thoroughly rocked. 24K (pronounced two-four-kay) debuted on September 6th, 2012 with “Hurry Up!” The original lineup was split into two units– acoustic unit 4K (Cory, Kisu, Sungoh, Seokjune) and hip-hop unit 2K (Daeil, Byungho). Before their debut as 24K, their acoustic unit released one mini album titled “Rocking Girl,” which showcased their amazing vocal ability with a more folk feel– a sound a little more uncommon in the world of KPOP. Before the release of their second mini album, which had the song “U R So Cute,” Seokjune left the group for unspecified reasons, being replaced by Jeonguk. Unlike their strong bad boy image shown in “Hurry Up,” the concept of “U R So Cute” allowed the members to show a cuter side. They even had little plush cat version of the members (too cute), which is a winner when trying to lure in fans of lighter concepts. However, shortly after promotions, Byungho disappeared and dropped out of the lineup following rumors regarding his private life. This left the group at five members– Cory, Kisu, Sungoh, Jeonguk, and Daeil. I’ll be honest. 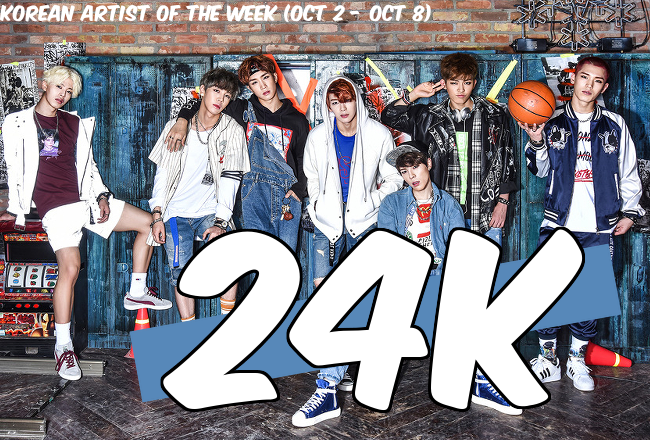 24K is one of my two favorite groups, and there are plenty of things for people to know when getting into them. The members have oodles (Yes, I said oodles) of interesting facts that some might be surprised to hear, especially since 24K isn’t one of the first groups people look up when diving into KPOP. This is usually the part where I have a gush session about a particular group, but I feel that some of these facts need to be known to get an understanding of why this group is so [email protected]#$*! awesome. For starters, the majority of writing and production credits belong solely to their leader, Cory Hong. He has a natural talent for music and creative vision matched by few idols who dabble in the production of their own releases. Call me biased, but I actually feel like Cory can be ahead of the trend at times. This is evident in his use of trap style music in “Hey You,” which is showing to be the next big thing in KPOP. In addition to his hard work behind the scenes, he has a voice that is as beautiful as it is recognizable. Another member that deserves some kudos would be Kim Daeil, their deep-voiced rapper. Being a badass, rapping, and showing fire visuals may seem like his only jobs in 24K, but he also has his hand in choreography. In fact, he’s part of Project X, the dance group that is comprised of members of various idol groups. Daeil isn’t only good at dancing, but this worker bee is also known for his work as a solo rapper under label VISMAJOR, where he is currently active under the name BIGONE. Wild, right? If you want to see a couple of Daeil dancing videos, check out this video of his own choreography and this video of Project X. You’ll be glad that you did. Cory isn’t the only member behind the music. In their latest album, all writing, production, and arrangement credits belong to five of the seven members. That’s quite the feat for a group with such a packed schedule. To end this edition of OneHallyu’s Korean Artist Of The Week, I’ll leave you with a badly photoshopped picture of Jeonguk (below) and their Pops In Seoul appearance. It’s what they would want.